Early November 2016, news of the Employees Provident Fund (EPF) officially initiating Akaun Emas was announced in newspapers and is set to be effective on January 2017. The specifics of how the Akaun Emas works is clear. When you reach the age of 55, an Akaun Emas will be opened if you continue to be employed. From age 55 onwards, your EPF contributions will be entered into the account and locked. You may only withdraw the accumulated money from the account upon turning 60 years old. Your previous contributions – prior to turning 55 – will be consolidated from your Account 1 and 2 into one account called the Akaun 55. Money within your Akaun 55 can be withdrawn as a lump sum, monthly, partial, monthly and partial or annual dividends withdrawals. At age 60, money from both your Akaun 55 and Akaun Emas will be combined to one account for withdrawals. According to the EPF’s chief executive, Datuk Shahril Ridza Ridzuan, the purpose of the newly launched Akaun Emas is to be a second retirement nest egg for their members to further help serve their needs when they retire. Whatever the concerns, the real question still remain; do you have enough money for your aged care and have you planned for it? To better understand if you would have saved enough for your aged care, let’s take a look at a case study. Mr Tan, 54 years old, is the sole breadwinner of his family with one wife and two children who are currently entering university. He is a full-time employee at Company X earning RM6000 a month. As soon as Mr Tan turns 55 years old in January 2017, his EPF account 1 and account 2 are consolidated into his Akaun 55, he proceeds to make a full withdrawal to pay for his children’s tertiary education. Still healthy and able, Mr Tan continues his employment with Company X and an Akaun Emas is opened for him. Mr Tan undergoes surgery and is hospitalised for 90 days before being discharged with the cost being covered by his insurance plan. Now in need of care, Mr Tan utilises money from his Akaun Emas to pay for care services and various supplies for daily living. However, Mr Tan knows his recovery from liver cancer remains unpredictable and worries for his family’s financial situation as his savings (and money from his Akaun Emas) can only last for so long. 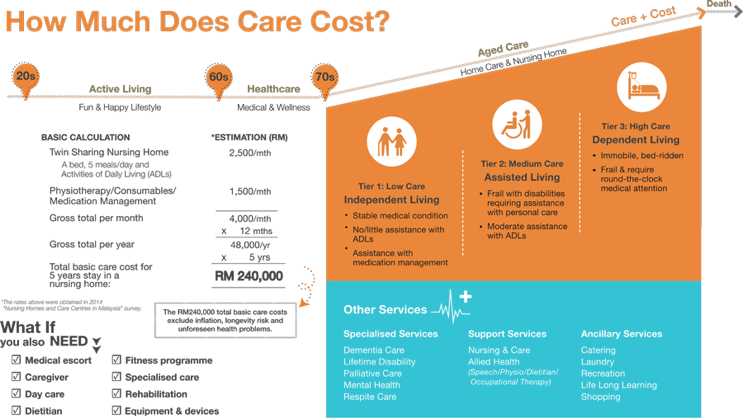 If your cost of basic care for 5 years is RM 240 000 – excluding inflation, longevity risks, and unforeseen healthcare problems – does your savings sufficiently account for these costs? Despite the great boost in EPF savings the Akaun Emas provides for retirement, it can only cover for your care costs for 2 years (plus a little more if you include your savings) if you have similar circumstances as Mr Tan. The Akaun Emas is a safe investment as the EPF – which guarantees a minimum dividend rate of 2.5% – has been performing well, as evident in the dividend rates given out being 4.25% – 6.4% over the last 15 years. However, statistically many who reach the retirement age of 55 (68% of EPF members) have savings less than RM 50,000 and many retirees spend their all of their EPF savings within 5 years. Furthermore, Malaysians are living longer lives with males and females at age 65 living up to 14.9 and 16.9 years longer respectively in 2015 than previously in 2010. That means the possibility of needing some form of care is inevitable hence planning for such is crucial and also to avoid placing unnecessary burdens on our children. Safety – Your money will be invested in a cash management solution offered by KenWealth by Kenanga Investment Bank. While the default fund has low risk, though you have the absolute discretion to switch and choose from the range of investment products offered by KenWealth. Integrity – Rockwills Trustee Bhd (as the trustee) will safeguard your interests and only act on instructions to pay for your care needs. Care Administration – You will have access to Care Administration to provide you with the right care and the right service at the right place and right time. Managedcare Sdn Bhd will assign you a Care Manager who will ensure the quality of care you receive is in sync with the appropriate healthcare and long-term care plan; based on care needs and financial affordability. Consolidated Assignments – You can assign your insurance policy to the CareTRUST™, allocating more of your money for your care. Unclaimed Money Protection – Any remaining balance not spent in CareTRUST™ will be given to your nominated beneficiaries. It pays to carefully consider what are your options for retirement and how your financial decisions influence your aged care. Though the Akaun Emas lock-in period is compulsory, you can still take proactive steps to plan for your retirement and aged care with your Akaun 55 savings to ensure your long-term care concerns are accounted for. The Akaun Emas is focused on your retirement, but the accumulated money will not be enough to cover the cost of long-term care that we will inevitably encounter. There is also the risk of not being able to make our own decisions due to circumstances like dementia and etc. It is good to have another option which is safe, specifically focused on care, and will assist your decision-making to mitigate difficult situations arising from being of unsound mind.